If you want to a go to one of the World’s messiest festivals then why not learn some Spanish and visit Spain this year and go to a festival where you can spend the day throwing rotten tomatoes at people. Wait, what, Tomatoes? That’s right people, a festival exists in the World where you essentially spend your day, launching piles and and piles of tomatoes at each other in the street before being hosed down by the local fire service. Ladies and Gentlemen, we bring you, La Tomatina, and here is your guide to this crazy Spanish festival. The festival takes place in Buñol, Valencia and has done since around 1944, its origins are unclear but the general thought is that it began when the townspeople became frustrated at the city councillors and rioted by throwing tomatoes at them to display their discontent. The years that followed saw the beginnings of the festival until it was banned in the lat 50s as a result of having no religious significance. After a swell of public support, the festival was reinstated in 1970 where it became an official festival and had rules imposed. the key year for the festival was 1975 where the introduction of tomato throwing became a key part of the festival and that has continued up until the modern day. The amount of participants that join the festival each year has risen to around 40,000 as of 2016. The festival is held on the last Wednesday of August during the week-long festivities of Buñol and the tomatoes arrive in trucks from local growers. 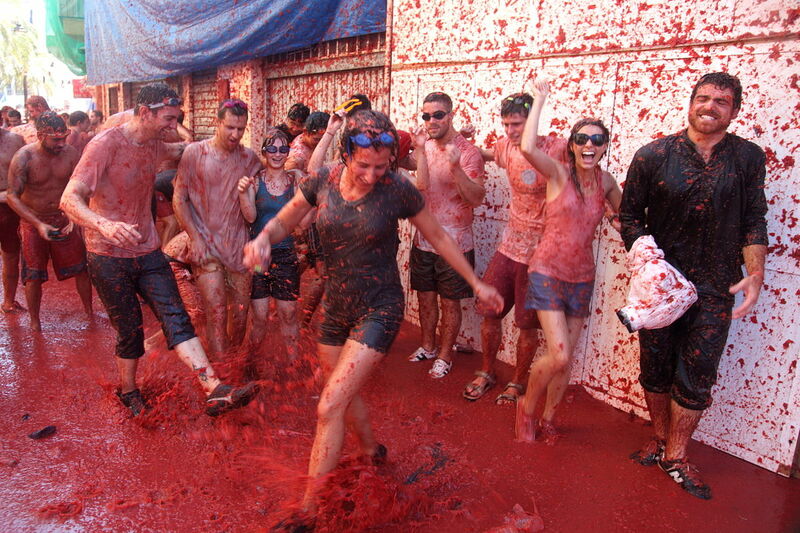 The tomato fight lasts for around one hour, the beginning of the fight is signified in a strange way but one that is much in line with the festival. At 9am there is a large, greasy pole with a ham tied to the end of it, people scramble to reach the ham and once someone has grabbed it, the fight begins. The rucks will tip around 130 tonnes of ripe tomatoes on to the waiting crowd and madness ensues. The hour-long fight culminates in the sound of a cannon where everyone is left covered in squelchy tomatoes and red from the juice. After the fight, everyone scrambles to find the nearest person with a hose to be cleaned down. – You must squish the tomatoes before throwing them in order to avoid injuring people. – You must not throw anything other than tomatoes during the fight. – Participants must make way for trucks and lorries coming through. – After the second cannon is sounded, no tomatoes are allowed to be thrown. As mentioned before, the festival takes place on the last Wednesday or August and in the town of Buñol, Valencia. Participation for the event costs 10 Euros and if you want to be one of those on top of the truck then you will have to pay a whopping 750 Euros. What better way to spend a Spanish summer day than launching tomatoes at strangers! Tagged carnivals, festivals, la tomatina, Spain.